Two-story building on Lispenard Street will get three stories and a set-back, two-story penthouse; adjacent five-story building gets a penthouse addition. 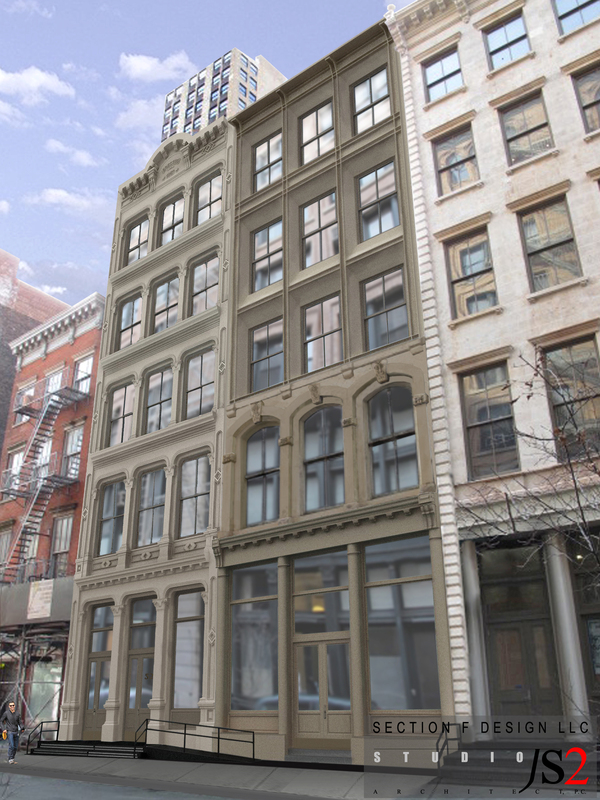 After rejecting two prior plans, Landmarks approved Murat Bugdaycay’s development proposal for two store-and-loft buildings on Lispenard Street in the Tribeca East Historic District. The plan calls for adding three stories and a set-back, two-story penthouse to a two-story building at 52 Lispenard Street, and a smaller, two-story penthouse to the neighboring five-story building at 54 Lispenard Street. 52 Lispenard once matched its neighbor’s height, but lost three stories after a fire in 1937. Both buildings feature cast-iron elements. Landmarks in February 2012 denied Bugdaycay’s initial proposal for the buildings. The Studio JS2-designed plan proposed demolishing 52 Lispenard Street’s facade and replacing it with a five-story, terra-cotta facade and a two-story penthouse spanning both 52 and 54 Lispenard Street. (read CityLand’s past coverage here). 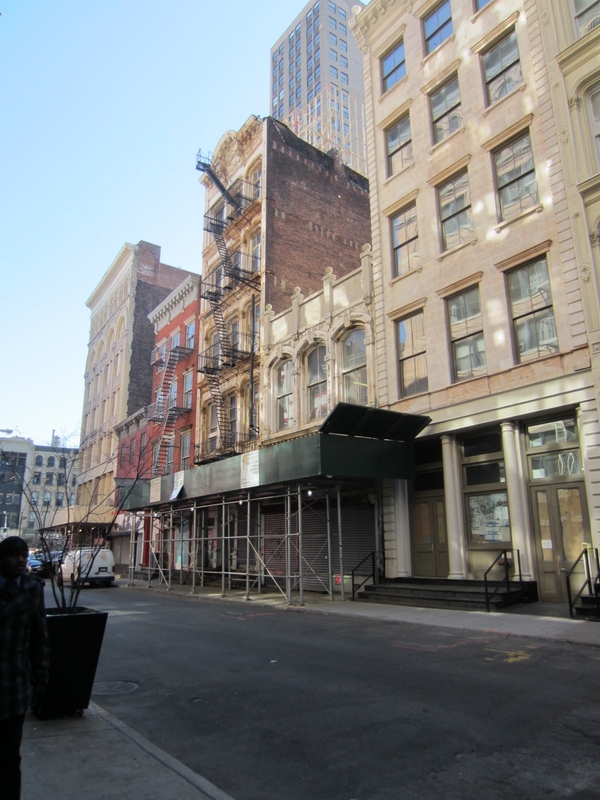 Bugdaycay returned to Landmarks in March 2012 with a revised plan incorporating 52 Lispenard’s historic features. James Schelkle of Studio JS2 and John Bellettiere of Section F Design presented the plan, which included retaining the existing two-story facade and adding three stories and a tiered, two-story addition. The extended facade would feature metal columns and lintels inspired by 19th-century cast-iron architecture. Bellettiere said the uniform design would allow the existing building’s historic fabric to stand out. The penthouse addition would still span both buildings, and been clad in stucco at the first level, and metal and glass at the second. The penthouse would be visible from several nearby vantages. The commissioners said the revised design was moving in the right direction, but recommended an additional reduction in size and visibility of the penthouse. The commissioners also asked the architects to alter the penthouse to preserve the unique identities of 52 and 54 Lispenard. Schelkle and Bellettiere returned to Landmarks in April with a revised design. The new plan altered the rooftop addition to reflect two different penthouses on the buildings. Although still visible from the street, the second-story of the penthouse on 54 Lispenard would be smaller and set back further than 52 Lispenard’s penthouse. Schelckle characterized the penthouse’s second floor on 54 Lispenard as “a greenhouse-type structure,” with a hipped roof and clad in matte-gray zinc. The second floor of 52 Lispenard’s penthouse would be clad in steel. Schelkle noted that the additions would be the same height as the set-back rooftop additions on adjacent buildings. The commissioners found the new design appropriately refined, but still offered criticism. Vice Chair Pablo Vengoechea found that the addition to 54 Lispenard “start[ed] overwhelming the streetscape” and said he could only approve a proposal with a one-story addition on that building. Commissioner Michael Goldblum said the plan was skillful and reasonable, but recommended lowering 54 Lispenard’s penthouse. Commissioner Margery Perlmutter objected to the use of stucco on the first floors of both penthouses. After further discussion, the commissioners agreed to approve the project, with the proviso that no portion of 54 Lispenard’s penthouse would be visible from the street. LPC: 52 and 54 Lispenard Street, Manhattan (12-6822) (April 17, 2012) (Architects: Studio JS2; Section F Design).